Release Date: October 26, 2012 – U.S.
What I initially expected out of "Fun Size" was a teen version of something like "The Hangover." However, upon seeing the childish orange Nickelodeon logo, my hopes were dashed and I had to severely temper my expectations. Well, as it turns out, the Nick branding is completely misleading. In a movie like this, the plot isn't terribly important, but here goes: Wren (Victoria Justice) is forced take her little brother, Albert (Jackson Nicoll), out for Halloween. Their recently-widowed mother, Joy (Chelsea Handler), is still grieving the loss of her husband and is spending the evening with her much younger boyfriend, 26-year-old Keevin (Josh Pence). That means Wren can't go to the big party. For her, it's a teenage tragedy on par with "Romeo & Juliet" because she was invited by the most popular boy at school, Aaron Riley (Thomas McDonell). But it gets worse! While trick-or-treating, Wren loses Albert. She enlists the help of her best friend, April (Jane Levy), to find him – and it isn't long before a nerdy boy, Roosevelt (Thomas Mann, "Project X"), and his Asian sidekick, Peng (Osric Chau), join the search. 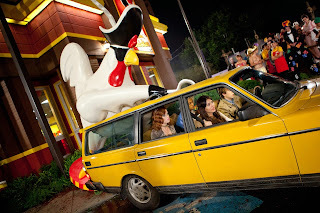 Then a giant chicken humps a car. A girl allows a boy to feel her breasts. Various adults "hang out with," kidnap, or make otherwise inappropriate jokes about an 8-year-old. We're introduced to two lesbian hippie parents who speak in ancient pre-Christian languages. Not to mention guns, feces, and a deranged cameo by Johnny Knoxville. Is this really what's being marketed to kids these days? Don't worry, I'm not about to step on some soapbox. All that really matters to me is whether I personally had a good time watching it. The script isn't particularly original and the jokes are geared toward the lowest common denominator – nothing here will win any awards, that's for sure – but I did laugh. Some of the scenes are funny, and a few moments near the end are actually touching too. What more could I possibly ask for? Well, many things. But "Fun Size" is a fun movie.